Back in the early 90s my husband took reflexology training from a woman who, it turned out, also taught people about Macrobiotic cooking. You guessed it, I signed up for the course. We met once a week for several weeks (maybe 6 or 8) and learned about what and how to cook for optimal health. We were told that brown rice-- but not just any brown rice-- had the most "balanced PH" of all the grains. Brown rice formed the frontispiece of the entire diet. It had to be cooked in a stainless steel pressure cooker. Because we lived on the same latitude as Japan, we were meant to eat as they did-- it was all about latitude and climate. Most stuff had to be cooked, including fresh fruit, to be digested properly. Salt seemed to be okay. We used sea salt and learned to grind it in with toasted sesame seeds to make up some sort of salty condiment to sprinkle over our brown rice. Potatoes and bread were verboten. Sea vegetables accompanied every meal. And tea. Following my recovery from what seemed like a very restrictive and unfamiliar way of eating, I continued to use my precious pressure cooker until I discovered that it was likely that all the essential enzymes were being pressurized into oblivion. One of the few enduring elements of my experience with Macrobiotics is my continued enjoyment of many sea vegetables. 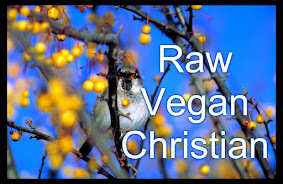 Recently it has begun to look like the Raw Vegan world is also experiencing some implosion and civil war. I have to admit (and have done so elsewhere in this blog) that I was relieved to find out that the very high standards set by some of the 'gurus' had been lowered. I'm 60 years old and although I have fairly high ideals, I began to doubt that I would ever achieve and maintain a 100% raw vegan diet. And did I even want to? After all, I'm a Type B Blood Type-- aren't I supposed to be omnivorous? Anyhow, today I just read a very interesting blog by one of my 'mentors' talking about the myths around the superiority of the locavore diet (the 100-Mile Diet, etc.). And is eating 100% organic the "cleanest" way to eat? These are certainly a couple of quandaries when it comes to wanting the best possible diet you can afford... how do-able is a locavore, high raw vegan, totally organic way of eating? Go HERE and see what Fred has to say about these "goals"-- you might be surprised at what you find out!